„BAREFOOT PARK” 2004 – A relaxful journey in time and space. The essence of the Project is to touch „oneself” and open to the endless diversity of existence, both the natural and the one created by man. An important aspect of the Project is the relation between the natural and what has been created by man. To establish this relation we must experience and become aware of the equivalent value of the elements used in the Project but at the same time we must feel their diversity and individuality. What our body needs is a kind of a sensory shock, due to living in a highly advanced technological civilization which isolates a number of human senses from the human being alone. We, terrestrials, must learn to respect the Earth we walk on, because our existence, along with everything Earth carries, is unity. Moreover, apart from the sense of sight which has a cultural priority and hearing, the sense of touch can also provide us with a lot of information about the surrounding world, as well as with a unique sensual experience. After all, the world, reality has a textural dimension as well. This is the philosophical sense of this project. The goal of the project is a „journey”, by means of the sense of sight and touch, through the past times of war and peace, through minor, everyday behaviors and gestures, through small and big discoveries, which activate the present thanks to a tactually experienced past. We are exposed to a textural experience, a huge collection of planes and spaces, both realistic and completely invented, e.g., the surface of Mars and the traces of the destruction in Pompeii, the bottom of the ocean and the imprints of a maze of railway lines, a battlefield in shambles, etc. The experience would have the value of an archeological site being explored in a state of repose. The world in a nutshell, multiplicity of experience in one. The applied textures range from very smooth, polished and shiny to course or even irritating (prickly). 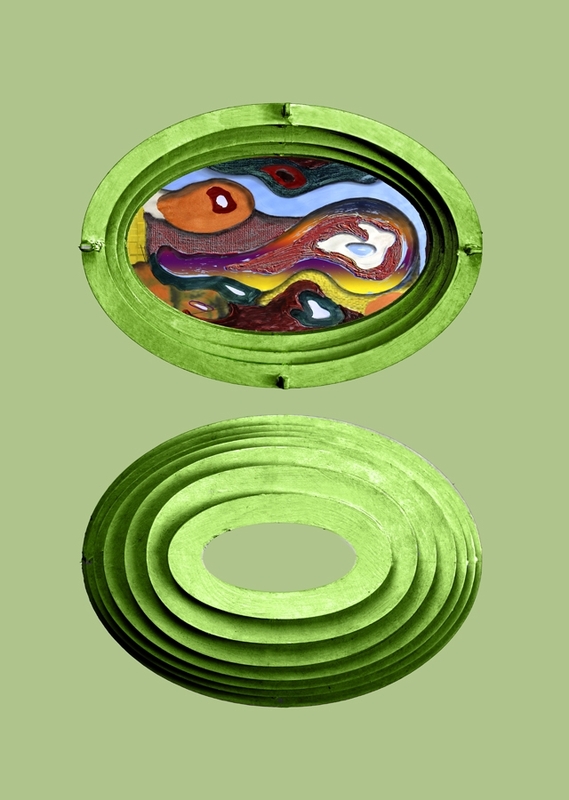 The visual form of a specific situation or station, its artistic semantics, as well as the type of surface used give the station its artistic meaning. The aim is to gain a possibly wide spectrum of sensual experience. 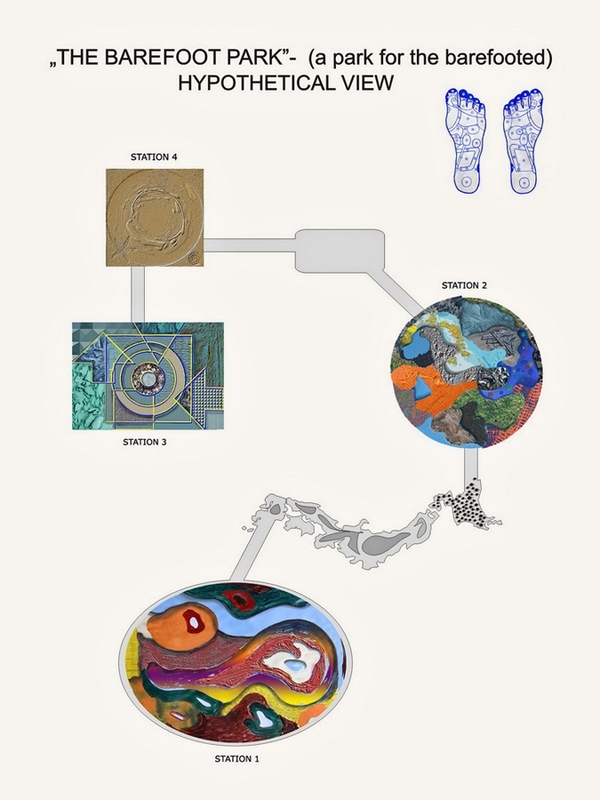 The journey of a bare, unshod foot personalizes openness, acceptance and, in a further dimension, sensitivity to the surrounding environment *. It is a journey in a “direct” state. Concurrently, the stations will fulfill, to a certain degree, a therapeutic function acting as peculiar fields for passive acupressure. Also could be useful for disabled persons, particularly blind for whom sense of touch is very important. The world, just like the universe, is a unity and a certain whole. Its borders are slowly becoming dependent on our consciousness. Hence, we should create models that bring us closer to its structure and the way it functions – incorporating our unique way of existing alongside other living organisms. The richness and multidimensional character of our perception is important for our existence and cognitive abilities in the future. Maybe by arranging net of such a parks we would be able to create some new style, awareness of being open to the environment, particularly among young people because of their ability to inner change and in result to change human environment itself. The applications have the form of imprints in different materials (e.g., colored concrete), but could also be made using paving stone, plastics or reinforced ground overgrown with different shrubs. The surfaces used can be of different quality in terms of their color properties and physiochemical composition. These types of bas-reliefs can be placed individually in public places or as a collection of adequately selected stations to form a park, for instance. A network of such parks could be established in different parts of the world. 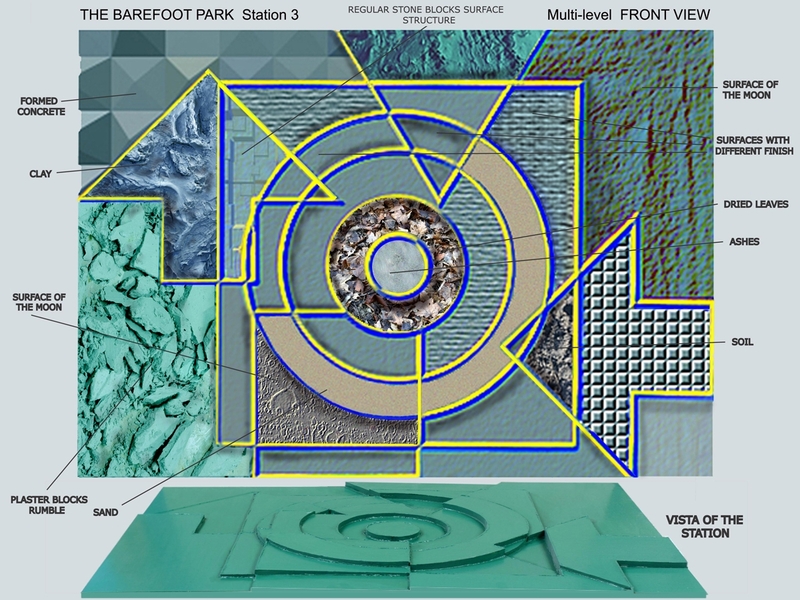 Individual stations, which together will form one park space, can be designed by a few outstanding sculptors. 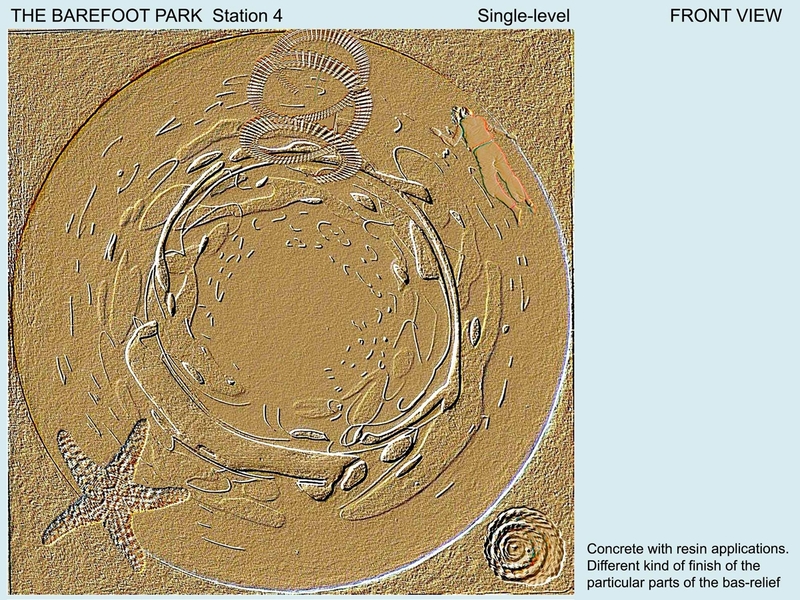 These stations will be, in fact, bas-reliefs with various forms, intended to walk over. Stations can be maintained also inside big plazas, markets, in private gardens, on the roof of skyscrapers etc. As an alternative ones can think about maintaining the project inside gallery. (That would look as a kind of Fluxus like event). The park would have to be equipped with a tap with running water for washing feet. I would propose to maintain stations easy to dismantle in order to install them again in different location (inside or outside). Proposed dimensions 1000 cm in diameter of a round station and around 1200x850 cm of the oval one. The range of possible structures is practically unlimited - from actually existing ones to totally created ones. 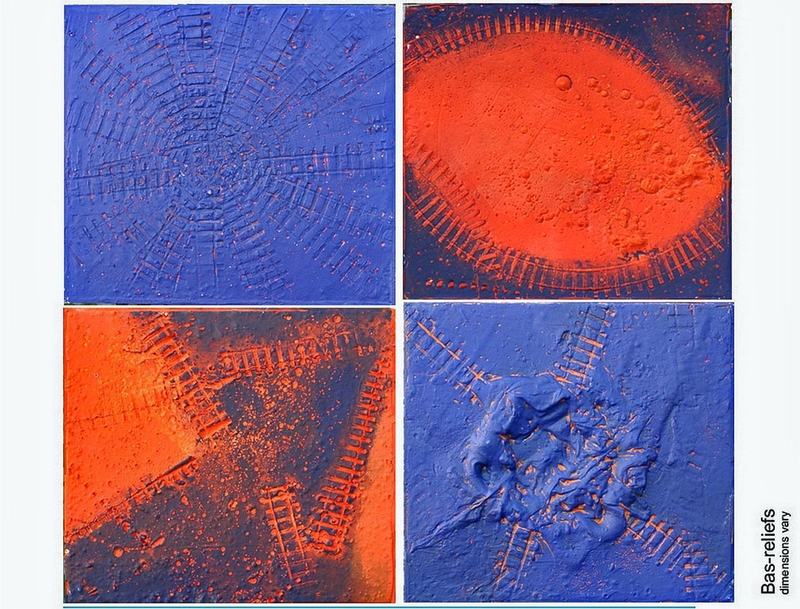 Imprints, castings in different materials (e.g., colored concrete), but could also be made using paving stone, plastics or reinforced ground overgrown with different shrubs. The surfaces used can be of different quality in terms of their color properties and physiochemical composition. They can be covered (or fused with surfaces or imprints of objects can be created) with some small natural objects such as pebbles, shells, pieces of wood, seeds, nuts, etc., and manufactured articles such as transistor radios, walkmans, bottles, bolts, parts of mechanisms, necessities, etc. 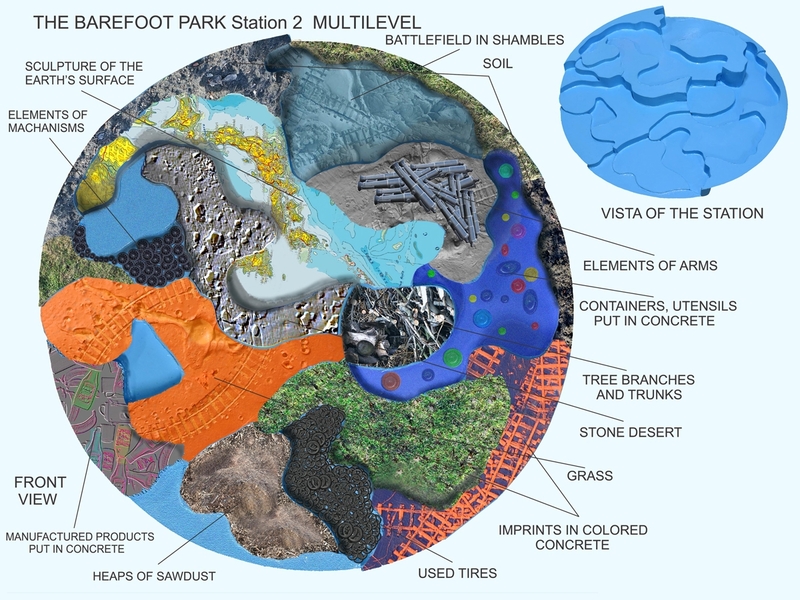 A HUGE TACTILE MANDALA – this could be the significance of the Bare Foot Park. (External map of the brain). Imprints of car wheels, car bodies, footprints, handprints; animal prints. Different types of grit, stones, sand, etc. Various perishable materials, both natural and manmade. Different types of forest bed, grass, twig, etc. - Plastic (grouped according to color and quality / article type. 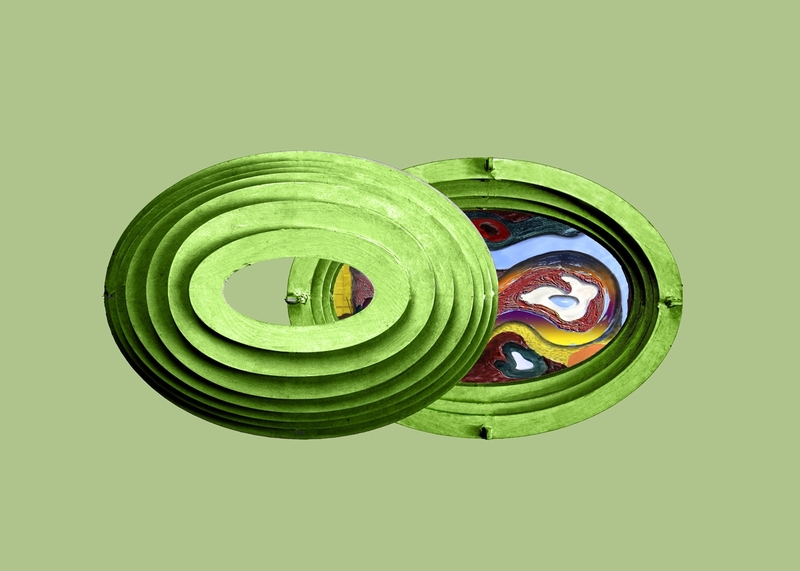 - from a scrap yard, elements grouped into, e.g., pots, spoons, frying pans, etc., or made from plastic. 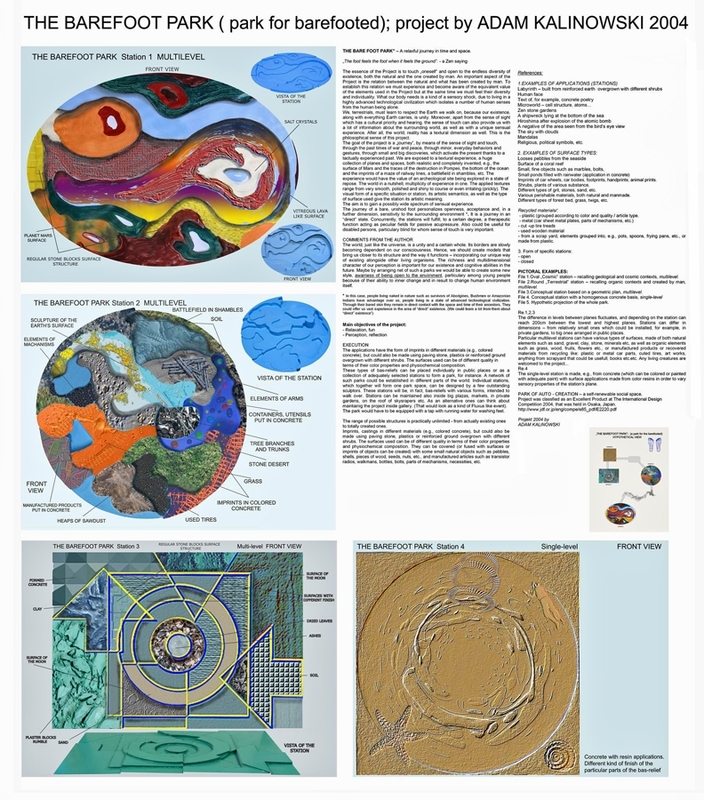 File 1.Oval „Cosmic” station – recalling geological and cosmic contexts, multilevel. 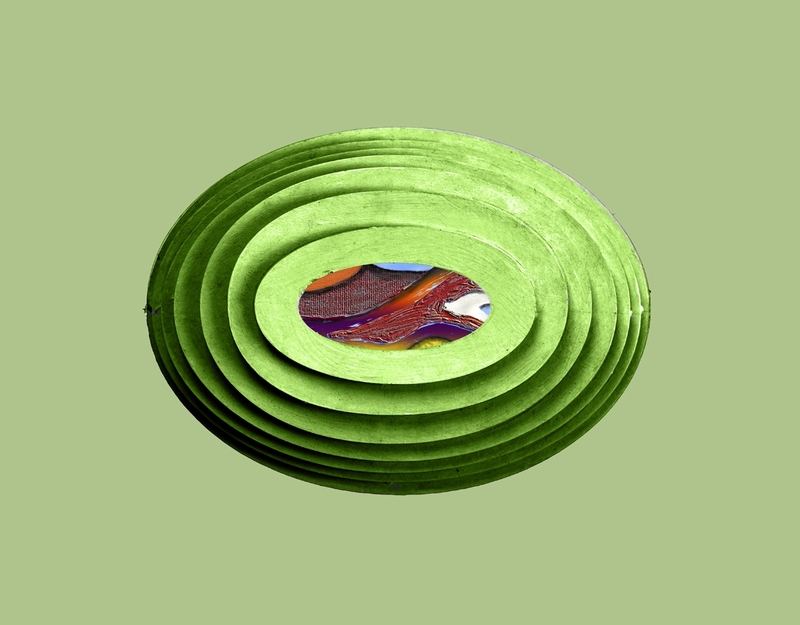 File 2.Round „Terrestrial” station – recalling organic contexts and created by man, multilevel. File 3.Conceptual station based on a geometric plan, multilevel. File 5. Hypothetic projection of the whole park. The difference in levels between planes fluctuates, and depending on the station can reach 200cm between the lowest and highest planes. Stations can differ in dimensions – from relatively small ones which could be installed, for example, in private gardens, to big ones arranged in public places. 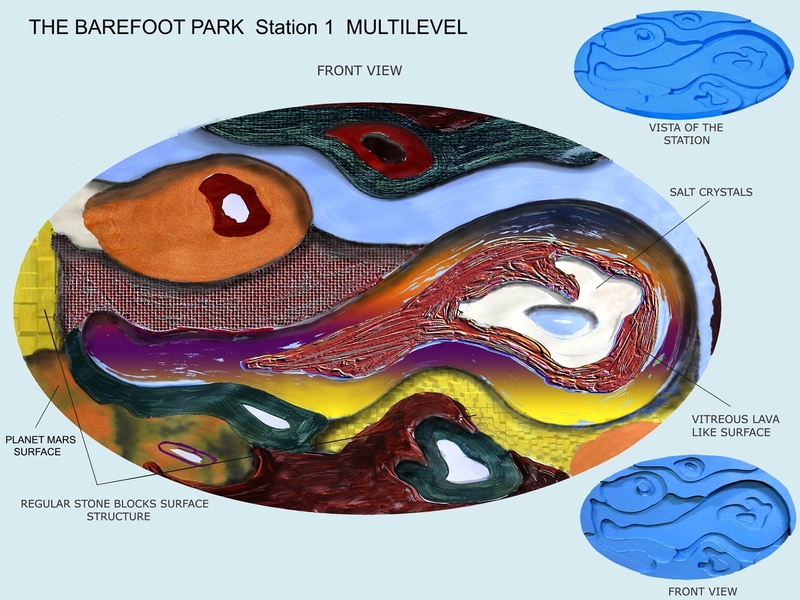 The single-level station is made, e.g., from concrete (which can be colored or painted with adequate paint) with surface applications made from color resins in order to vary sensory properties of the station’s plane. PARK OF AUTO - CREATION – a self-renewable social space. Project was classified as an Excellent Product at The International Design Competition 2004 that was held in Osaka, Japan in 2004. „PARK BOSEJ STOPY” - Podróż w czasie i przestrzeni w stanie relaksu. Projekt do realizacji w przestrzeni miejskiej. „Stopa czuje stopę, gdy ta czuje ziemię”. Istotą projektu jest abyśmy dotknęli „samych siebie”, otwierając się na nieskończoną różnorodność bytu, zarówno tego istniejącego naturalnie jak i tego wytworzonego przez człowieka. Ważnym aspektem projektu jest relacja tego co naturalne, do tego, co wytworzone przez człowieka. Temu ma służyć doświadczenie i uświadomienie sobie równowartościowości użytych elementów w projekcie - tych pochodzenia naturalnego jak i elementów wytworzonych przez człowieka. Jednocześnie jednak ich różnorodności, inności. Nasze ciało potrzebuje pewnego sensorycznego szoku, za sprawą stylu życia w wysoko wyspecjalizowanej cywilizacji technicznej, która izoluje szereg zmysłów człowieka od niego samego. My, Ziemianie musimy nauczyć się szanować Ziemię, po której stąpamy, bo nasze istnienie, wraz ze wszystkim, co niesie ze sobą Ziemia to jedność. Poza tym, obok zmysłu wzroku, który ma kulturowy priorytet, oraz słuchu, zmysł dotyku, może nam także dostarczyć wielu informacji o otaczającym świecie, a także niepowtarzalnego z niczym innym doświadczenia zmysłowego. Świat, rzeczywistość ma przecież, również wymiar fakturalny. Taki jest filozoficzny sens tego projektu. ( których dotknięcie tonizuje widza), przez świecące, do szorstkich czy nawet drażniących (kłujących), tak by pokonanie ich stanowiłoby pewne wyzwanie dla uczestnika. Ukształtowanie plastyczne danej stacji, jej plastyczna semantyka oraz rodzaj użytej nawierzchni, tworzą sens plastyczny danej stacji. Celem jest możliwie szerokie spektrum doświadczenia zmysłowego. Podróż bosej, nieobutej stopy jest uobecnieniem otwartości, akceptacji i w dalszym wymiarze, wrażliwości na otaczającą przestrzeń*. Jest podróżą w stanie niezapośredniczonym. Jednocześnie stacje, będą pełniły w pewnym stopniu funkcję terapeutyczną, jako swoiste pola do stosowania biernej akupresury. Świat jako kosmos jest jednością i pewną całością jednocześnie. Jego granice powoli stają się udziałem naszej świadomości. Tak, więc powinniśmy tworzyć modele przybliżające nam jego strukturę, jak i funkcjonowanie – włączając także nasz, niepowtarzalny sposób istnienia obok innych żywych organizmów. To, jak bogato i wielowymiarowo go postrzegamy, jest ważny dla naszego istnienia i naszych możliwości poznawczych w przyszłości. * Tu przewagę nad nami, ludźmi żyjącymi w stanie zaawansowanej cywilizacji technicznej, mają ludzie żyjący w stanie nagości w naturze, jak niedobitki Aborygenów, Buszmenów czy Indian z Amazonii. Poprzez odkrytą skórę, pozostają w bezpośredniej łączności z przestrzenią i czasem przodków. Mogliby nam służyć dużym doświadczeniem w zakresie egzystencji „niezapośredniczonej”. kamyki, muszle, kawałki drewna, nasiona, orzechy itp. jak i przedmiotami wyprodukowanymi przemysłowo jak Np. radia tranzystorowe, walkmany, butelki, śruby, części mechanizmów, przedmioty codziennego użytku itp. Tego typu płaskorzeźby można umieszczać pojedynczo w miejscach publicznych oraz w formie zbioru odpowiednio dobranych stacji w formie Np. parku. Jest praktycznie nieograniczony zakres użytych aplikacji; od realnie istniejących do całkowicie wykreowanych. Można zaprosić kilku wybitnych artystów-rzezbiarzy do zaprojektowania poszczególnych stacji, które będą tworzyły razem jedną przestrzeń parkową. Dane stacje będą w istocie różnorodnymi w formie płaskorzeźbami do chodzenia. Można by utworzyć sieć takich parków w wielu miejscach na ziemi. Miejsca lokalizacji są zależne od skali danych stacji, ale można przyjąć, że stacje mogłyby być instalowane w parkach, wewnątrz budynków użytkowych typu centra handlowe, na dachach biurowców itp. Jako wariant można także pomyśleć o przystosowaniu projektu do realizacji wewnątrz galerii. Wtedy miałby charakter czasowy. W parku trzeba by wydzielić miejsce z bieżącą wodą do pielęgnacji stóp. WIELKA DOTYKOWA MANDALA – taka miałaby być wymowa Parku Nagiej Stopy. (Zewnętrzna mapa mózgu). Projekt jest przeznaczony do aktywowania sfery publicznej. Może być zrealizowany w dowolnej konfiguracji na otwartym powietrzu lub w przestrzeni zamkniętej. Może być dostosowany do konkretnej rzeczywistości społeczno – kulturowej, przywoływać znaczenia, które są ważne jak i te, które są przez nią pomijane. Odciski od kół samochodowych, karoserii samochodowych, ślady stóp, dłoni; ślady zwierząt. Różne rodzaje grysiku, kamieni, piasku itp. Różne rodzaje ściółki leśnej, traw, patyków itp. Itp. PARK AUTOKREACJI – samo odnawialna przestrzeń społeczna. 2.Stacja okrągła „ziemska” – przywołująca konteksty organiczne i wytworzone przez człowieka, wielopoziomowa. 3.Stacja koncepcyjna oparta na planie geometrycznym, wielopoziomowa. 5. Hipotetyczny rzut całości parku. Różnica poziomów między podestami waha się i w zależności od stacji, może wynosić, między najniżej i najwyżej położonym do 200 cm. Stacje mogą mieć wymiary zróżnicowane – od stosunkowo niedużych; które można by instalować np. w prywatnych ogródkach, do dużych, aranżowanych w miejscach publicznych. - z tworzyw sztucznych ( pogrupowane kolorystycznie i jakościowo/ artykułowo). - ze złomowiska, elementy pogrupowane Np. garnki, łyżki, patelnie, kółka, sworznie, tryby, śruby itp. oraz także jakiekolwiek przedmioty z tworzyw sztucznych. - piasek, żwir, glina, kamień itp. - owoce, warzywa, kwiaty czy wszelkiego rodzaju rośliny. Stacja jednopoziomowa wykonana jest np. z betonu, ( który może być kolorowany albo malowany odpowiednimi farbami), z aplikacjami wykonanych z kolorowych żywic na powierzchni, w celu zróżnicowania właściwości sensorycznych powierzchni stacji. Projekt został wyróżniony jako EXELLENT PRODUCT na International Design Competition 2004, Osaka, Japonia.